Internet's Best Secrets: Galaxy S4 Active not so Waterproof after all? 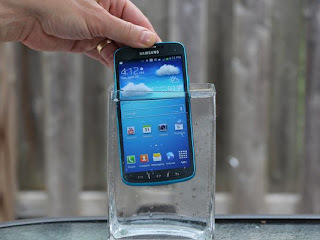 Galaxy S4 Active not so Waterproof after all? Looks like Samsung's Galaxy S4 Active is about to be awash in regards to its waterproof capabilities. According to some users, it looks like there's a suspicious amount of S4 Active smartphones dying or malfunctioning after being submerged. There's a chance that this might be due to improper usage - for the S4 Active to be waterproof you need to make sure you have the back cover properly installed and its ports covered with protective plugs. But in some cases, the reports come from people that are absolutely sure they did everything right, and the water sill managed to get in. And strangely enough, Samsung does not cover water damage on the S4... which sounds kind of strange for a "waterproof" device. Maybe the best thing is for you to pass on waterproof smartphones until its manufacturer does cover water damage - meaning they're absolutely certain there's no way you can get it wrong and can safely use it in/under water. Until then, maybe its better for you to postpone that water submersion test you had planned to impress your friends.